When Jane, Skip's wife of thirty-seven years, died, he felt like he'd died with her. He knew that there would be life after death for Jane, but he never thought there would be life after her death for him. Stages of grief vary from person to person -- many get angry and many focus that anger on God. As Skip wandered through the wilderness of life without Jane, one thing kept him going -- his faith in God. He knew that without God, getting through the worst time in his life would be almost impossible. 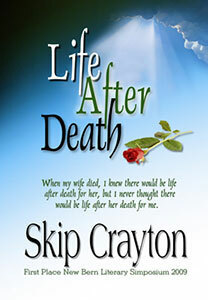 Life after Death is the story of how Skip struggled through Jane's illness as her caretaker. How, after being given a miraculous gift of healing, only weeks later found Jane fighting a totally different disease, one that would quickly take her life. Skip's story is not just one of despair, it is how faith in God can show us how He will reach out to us and carry us through the toughest times of our lives. It's also a story of promise and inspiration -- a story of how God led Skip to find a new soul mate in Carol and a son in Sam, a son he never thought he'd have. It is the story of how God brought Skip back into the light of the living and gave him life after death -- a promise He makes to all who have faith in Him.